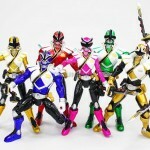 As we approach the summer months it is with a sad (or thankful) heart that one of the more collected items from the Power Rangers franchise winds down to an end – we’re talking about the popular (and sometimes hard to find) Ranger Keys from the Power Rangers Super Megaforce toy line. With the final wave of exclusive keys being released at Toys’R’Us as well as ToysRUs.com, many fans and collectors are finishing off their key collections. To celebrate one of the more popular gimmicks in the franchise’s long history, we’re spending the rest of the week doing various galleries of the Ranger Keys with a self-proclaimed title of Ranger Key Celebration Week! 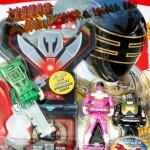 First up is none other than one of the last packs to be released – the Power Rangers Samurai Set B pack which contains the Red Samurai Ranger (Translucent), Pink Samurai Ranger, and the Gold Samurai Ranger keys. 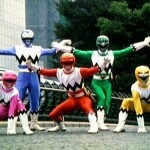 The only key left out from this team is, sadly, the Yellow Samurai Ranger (and the female Red Samurai Ranger). But getting in to the debate as to why we needed three versions of the male Red Samurai Key is a debate for another time! Check out over 25 images of this key pack by clicking the link here or by clicking the “Discuss” link at the end of the article! We’ll be throwing up galleries all week – don’t miss it! Don’t forget to check out all of our past Ranger Key galleries! 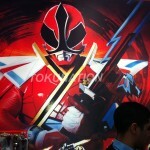 See you tomorrow with another Ranger Key Celebration Week gallery! This is a good way to the team all at once, or it could be a neat gift. 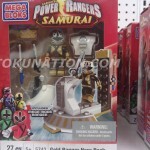 Take a look at the packaging after the jump and happy hunting! 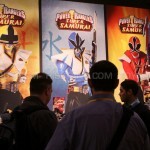 The crew covering San Diego Comic-Con 2012 for the network have sent along a high-quality gallery of the Power Rangers Final Victory figures. Photos taken by our good friend Destro. Looking forward to the low quantity(only 300!) 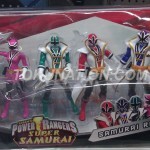 SDCC Exclusive Power Rangers Samurai Set? 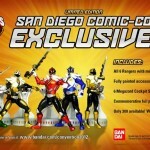 If you’re going to SDCC soon and plan to hunt this set down, check out a FAQ posted by Bandai America recently! What forms of payment will be accepting? On Sale Wednesday 7/11 thru Sunday 7/15, while supplies last. Will the figures be available on Wednesday (Preview) night? There’s a maximum 5 per person. Price to be revealed at the convention! 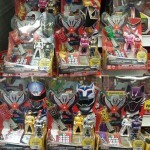 Thanks to TokuNation.com admin Tony_Bacala for the heads up! Thanks and shout out goes to Brian for taking these high res shots! There’s more, check everything out after the jump!